This is another variation on the VW Camper Bus/Vanagon/Westphalia. If you click on the picture to enlarge, you will see some of the additions to the roof . Also, an interesting trailer. If some of you have ever driven VWs, you will question how much of a trailer , if any, you would tow. 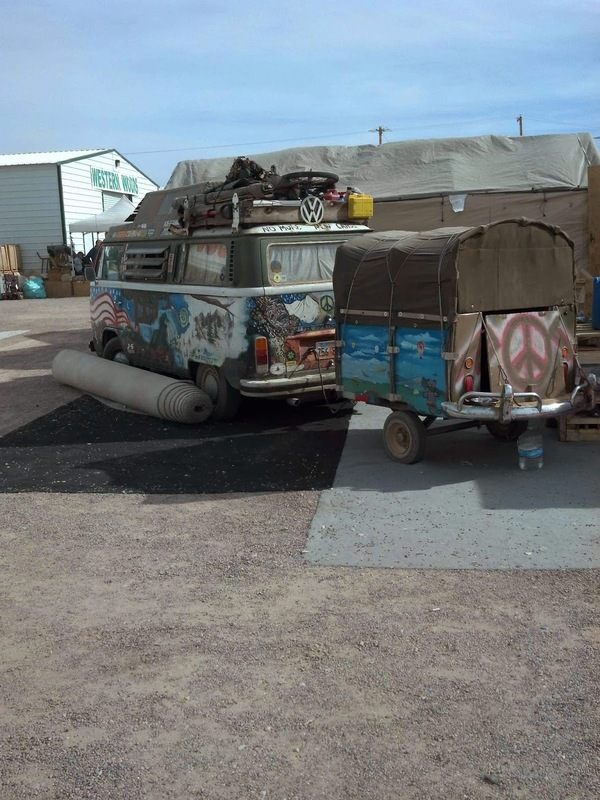 The owners were helping vendors to clean up and close down after Quartzsite. They may have been also working for other vendors during the busy weeks. While installing our solar panels, Marvin discovered that our house battery shutoff did not shut off anything. After tracing the problem, he discovered that our solenoid--under the hood, was dead in the closed position. We didn't even know we had one. Evidently this little gadget allows the truck alternator to charge the house batteries while driving, but keeps the house batteries and current from discharging the truck battery while stopped. 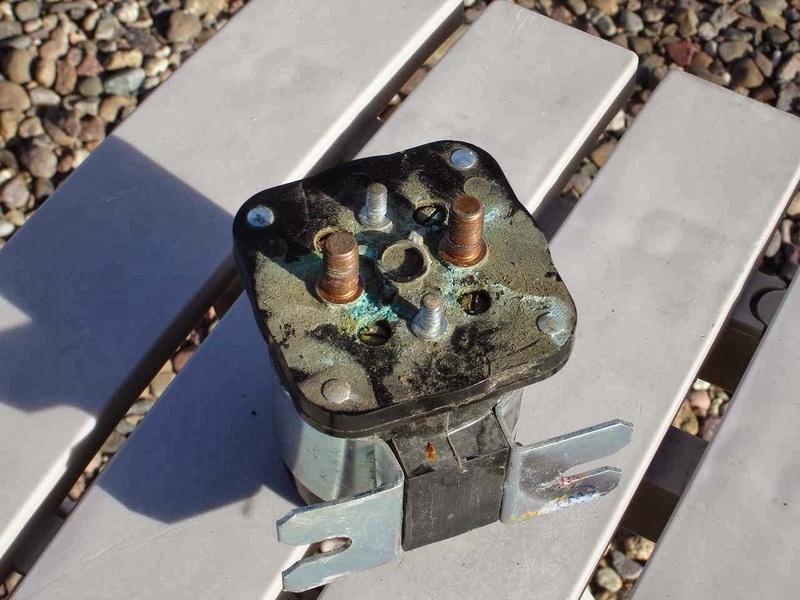 We are not sure why it died, but water leakage on the solenoid is a possible culprit. On to California! 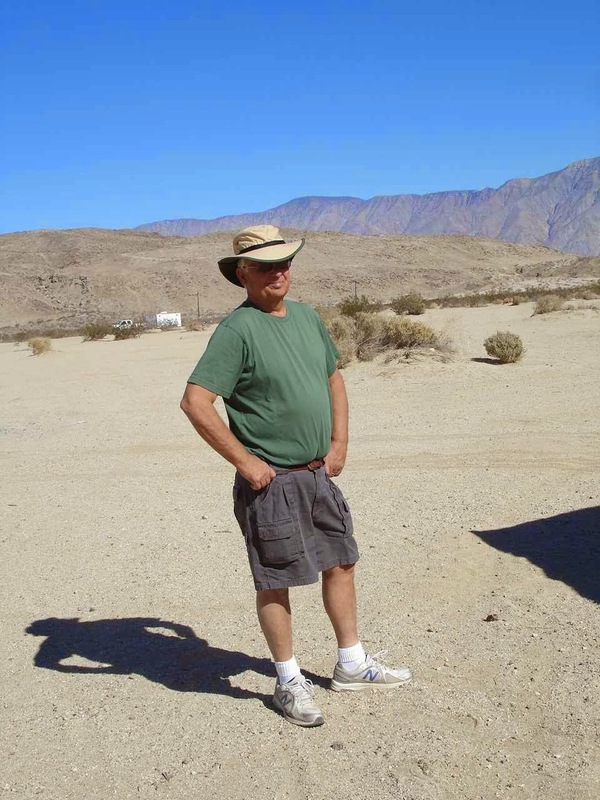 We are heading for Anza-Borrego Desert State Park, but we looked for a stop in between. 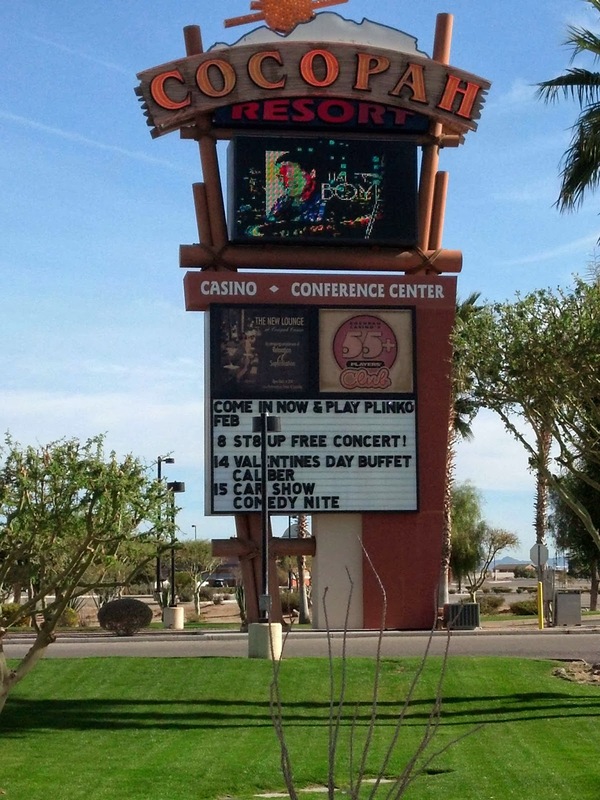 We had never stayed at a casino, so we looked into one in Yuma, Arizona. Many casinos offer discounted , or sometimes, free overnight parking to RVers with the hope that they will use the facilities. We saw some good reviews for Cocopah Casino so we gave it a try. They charge $5 to stay for 3 nights. 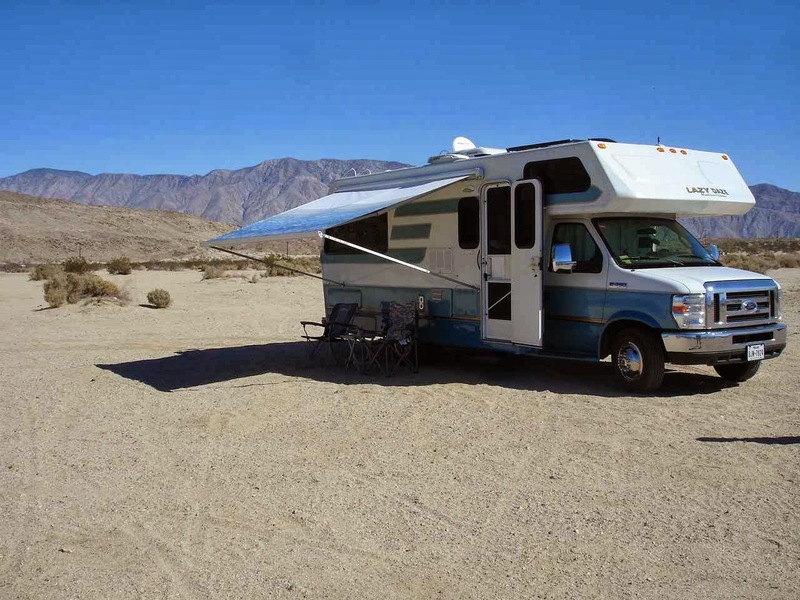 There is a designated spot for RVs that is well planned with plenty of room--basically two parking spaces for each RV. There are even trash barrels for convenience. We found our neighbors interesting and friendly, but discovered that we are not really gamblers of any kind. 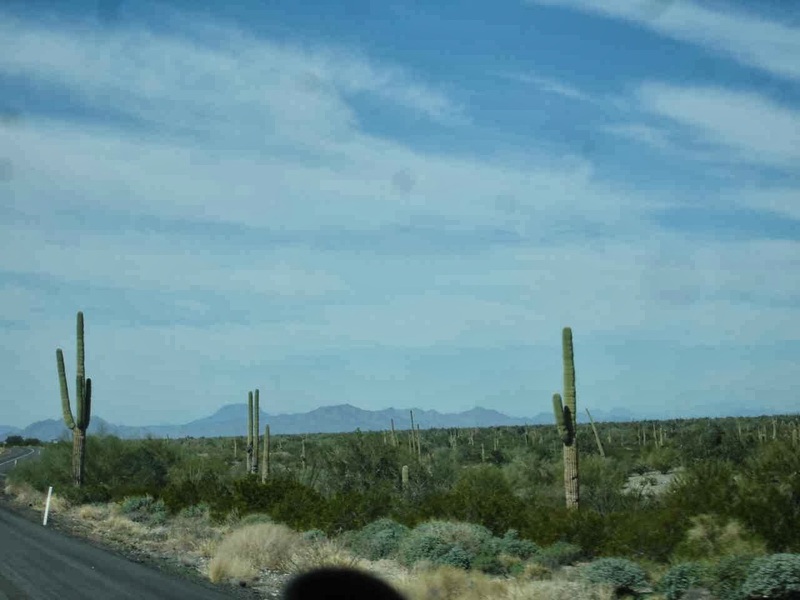 Eustis likes to look at the Saguaro cactus on the route. There are fewer now in California and then they disappear. If you have a chance, Emilie and Madison, take a look at that US map to see where the Colorado River forms a border between Arizona and California. 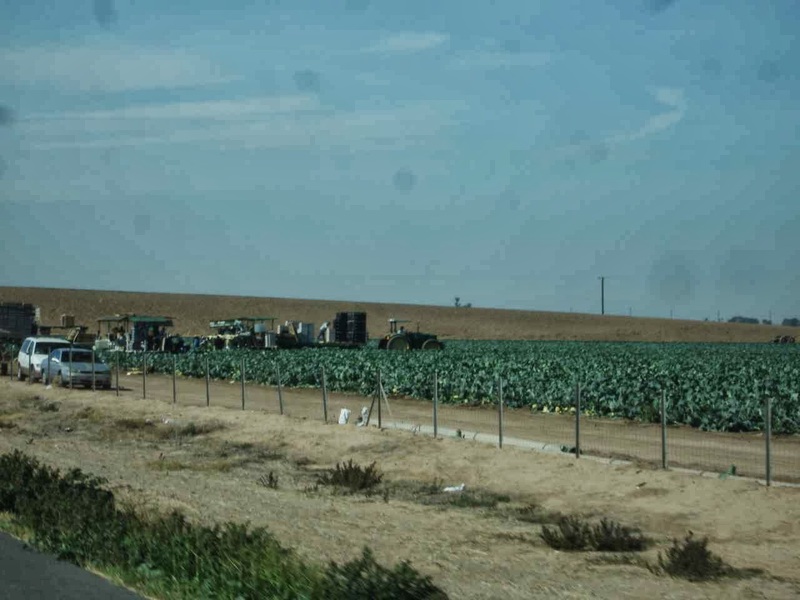 We have seen hundreds of miles of irrigation canals that connect to the Colorado River and provide water for farmers. 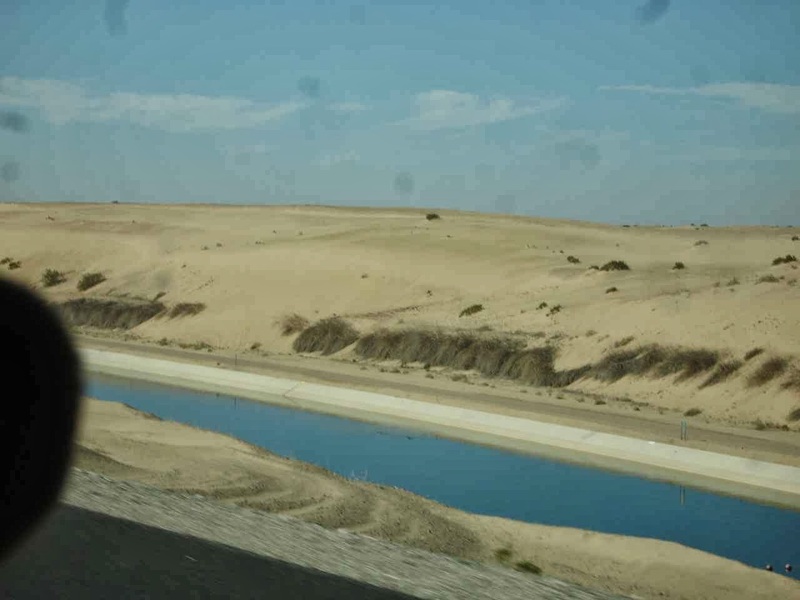 This was unusal to see sand dunes like on Cape Cod with this irrigation canal and no farming anywhere is sight. This was just into California on Route 8. It's not too long, though, before we see fields after fields of crops. All different and different colors. Some are still growing, some are turned over for new crops, and some--like this one--are being harvested as we drive by. Far from towns, the workers have been transported to the fields . There are individuals in the fields doing back breaking work. Also , usually, a wide contraption with a number of workers on board sorting and boxing the produce before it goes onto a trailer truck for delivery. This field looked like either cabbage, broccoli, or such. We'll take other suggestions. The first glance suggests a nursery selling palm trees. But then you realize that there are too many palms and no selling barn nearby. 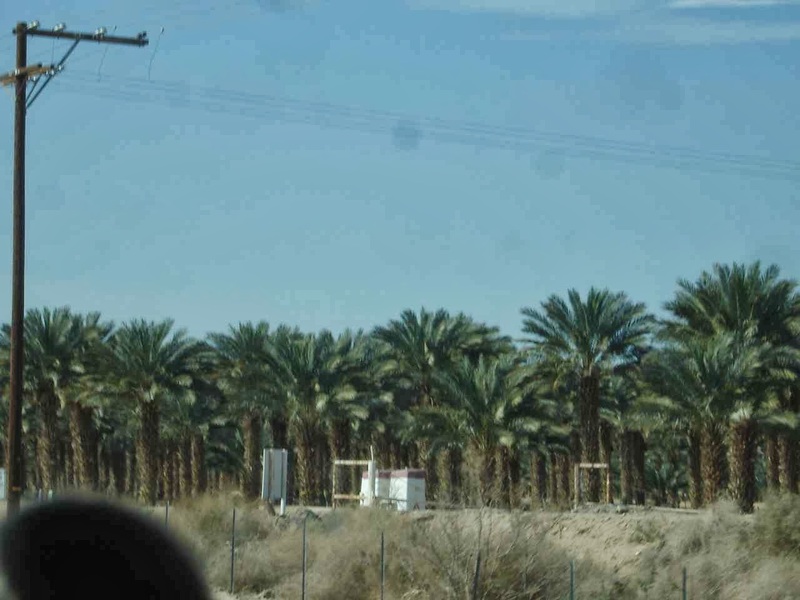 So, the next conclusion is that these are date palms. After some of the green fields, we are back to open desert. Lots of creosote bushes. And then, lots more very green fields. 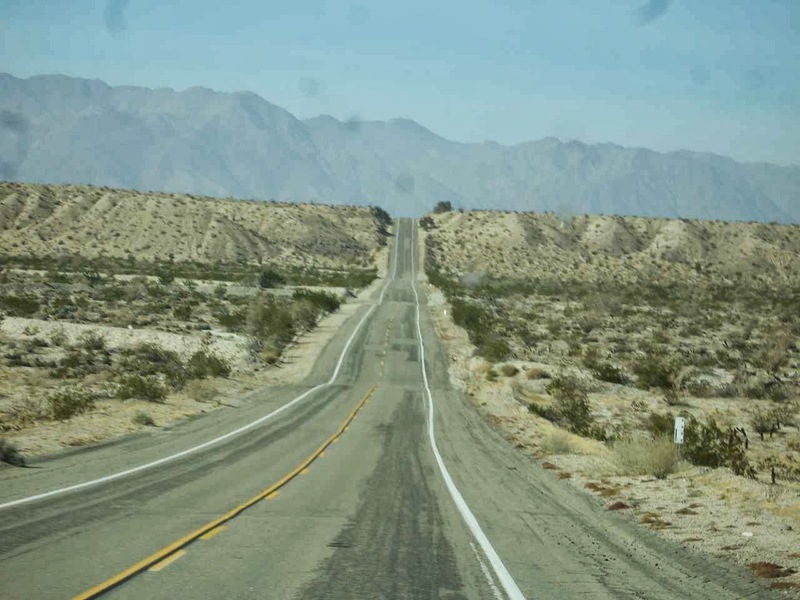 And then mountains in the distance as we turn off for Anza-Borrego. 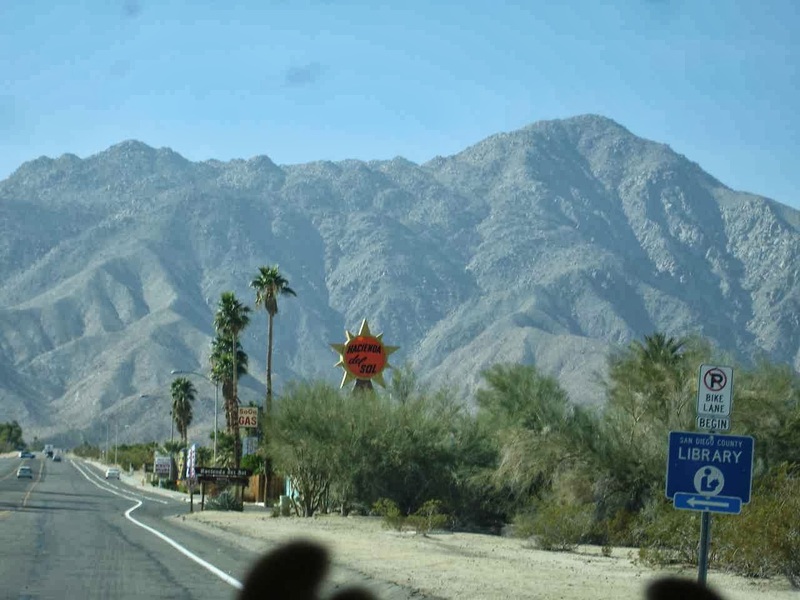 Approaching the Visitors Center, we pass through Borrego Springs. We will come back this week to walk the town. First stop, though is the Visitor's Center which has good information and a local map for the state park. We have a lot to learn, but we note that the park is 634,000 acres! Just to compare, Sebago Lake State Park in the state of Maine seems plenty large and is 1,400 acres. 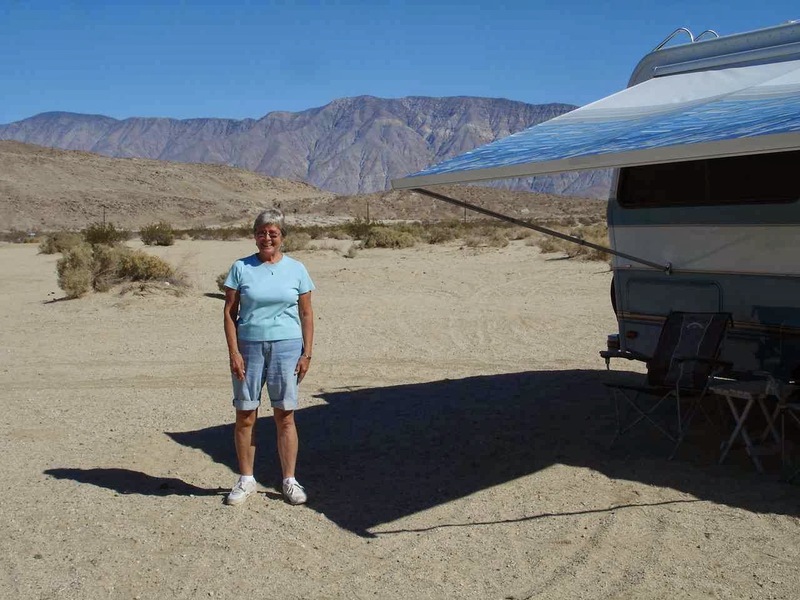 We indicate that we would like to boondock and the friendly ranger in the office shows us where there is good boondocking on what she calls "hardpan" meaning a hard surface, so we need not worry about getting stuck in sand. As you can see, we are overwhelmed by close neighbors-----Not! The cost is $0.00 and we are quite comfortable and feeling safe. Grandpa's got a brand new bag-----er, I mean, hat. It may look strange, but the hat helps keep the ears and the neck from being sunburned. Also, quite comfortable.